Resurrection Remix has become one of the most popular custom ROMS for Android devices. The same goes for other custom ROMS such as Pixel Experience, Lineage OS and Paranoid Android as well. All of the custom ROMS have their own set of features and functions. Resurrection Remix is known for its full fledged configurations options ranging from several customization, tweaks, pie controls, power management, themes, merged latest Lineage and AOSP sources, and much more. So download and install the latest Resurrection Remix 6.1.0 based on Android 8.1 Oreo. The new RR ROM 6.1.0 nightly builds are out with June 2018 Android Security Patch and more. 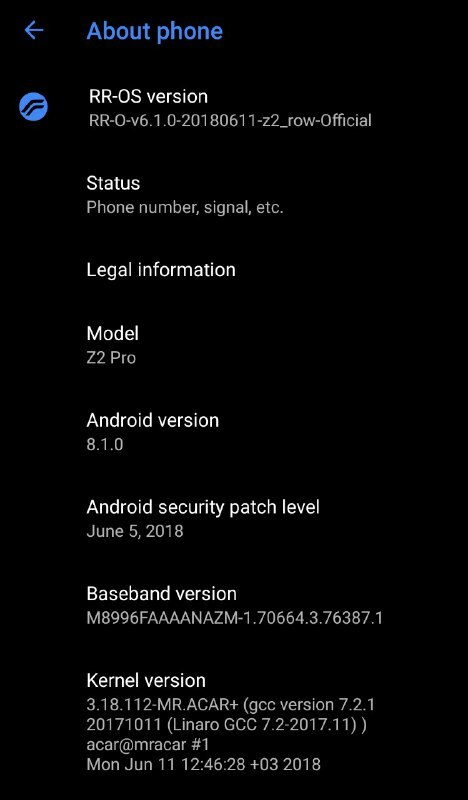 While Android P Beta 3 is out officially from Google, Resurrection Remix 6.1.0 is still based on Android 8.1 Oreo, of obvious reasons. It also features updates from LineageOS, Translation updates, and miscellaneous bug fixes. You can visit this Github repository for full changelog. As the development, the first builds of Resurrection Remix 6.1.0 ROM are up for several Android devices including OnePlus 3, 3T, Xiaomi Redmi Note 4, and many more. Not all the devices are receiving the latest build right now. However, developers and device maintainers are working in compiling the RR 6.1.0 ROM for all the devices listed below. See the download section and how to install instructions below. Note: Before you proceed, it is advised to visit the Resurrection Remix 6.0.0 post for all the notes and warnings. The following devices will receive the latest Resurrection Remix 6.1.0 based on Android 8.1 Oreo June 2018 Security Patch. For further updates, stay tuned and bookmark this post. The following are codenames for the Android devices. To check the name of your device codename, check out our previous list or RR here. How to Install Resurrection Remix 6.1.0 for all Android devices? Before you begin, you may want to take a look at the Google+ posting for any bugs, and extra information that is needed for installing Resurrection Remix Oreo. The installation procedure is simple. As this is a custom ROM, you may need to flash the Decrypt zip first in order to disable forced encryption on OnePlus 5/5T or any Android device. Make sure your Android device has Unlocked Bootloader, and is rooted with latest TWRP recovery. See how to install TWRP on Android. If you need decryption or bypass DM-verity check, then first flash the Decrypt zip zip via TWRP. Download all the files from above including Resurrection Remix ROM, SuperSU/Magisk, Gapps, etc. Find the codename of your device from here. Reboot phone into TWRP recovery mode. Now, Wipe the system, data, cache. DO NOT wipe internal storage! Go to home screen on TWRP and flash latest RR ROM. Followed by flashing Gapps and SuperSU/Magisk. Flash only one of SuperSU or Magisk. Hope you enjoy your Resurrection Remix 6.1.0. Let us know it in the comments section.